Flowers for all Occasions by Fareham's Moonstones Florist. Whether it be for a birthday, new baby, wedding anniversary, get well, christening, engagement, Christmas present, Easter gift, or just to tell someone you're thinking of them, Moonstones can help. 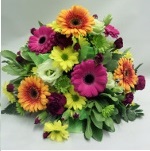 Arrangements can be created in individual colours or shapes to give that special someone a very unique personal gift. For that extra special Birthday or even anniversary gift why not incorporate someone's birth flower or send a special message with a specific colour. We have a small selection available to order online but if you don't see what you are looking for please get in touch as the possibilities are too numerous to list them all on our website. We have a daily delivery of fresh flowers and all our creations are carefully transported and personally delivered by our own drivers. Orders can be placed online for delivery in our local delivery area. In most circumstances we can deliver to a wider area but ask that you contact us first so we can ensure we are able to fulfill your particular requirements. Handtied bouquets come beautifully arranged in their own bubble of water ready for immediate display. 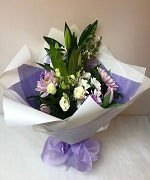 They can be made in any colour or flower combination starting from £25.00. Basket arrangements come beautifully arranged in their own oasis block ready for immediate display. They can be made in any colour or flower combination starting from £30.00. Traditional Bouquets come beautifully arranged and protected in cellophane ready for display in the recipients favourite vase.They can be made in any colour or flower combination starting from £20.00.